We just celebrated our 10th year as a Trane Comfort Specialist Dealer. Trane is the leading supplier of heating, cooling and indoor air quality products. We were also selected as the York News Times Difference Maker for the month of August 2012! To provide our customers in York and the surrounding area with quality service, reasonable pricing and 100% customer satisfaction guarantee! Locally owned, York Heating & Air Conditioning has been proudly serving the York community for 31+ years. We provide service on all types of heating and air conditioning units including GeoThermal units. Our Staff are factory trained, NATE certified, NFI certified and certified in refrigeration. Our showroom has a variety of hearth products on display including, Corn & Pellet stoves, Gas Fireplaces, Wood stoves and hearth pads. We also have a full sheet metal shop complete with a new plasma table for custom sheet metal work. Gary Osentowski and Larry Lind started the company in 1978. Since then Larry has retired, but Gary is still running the company. 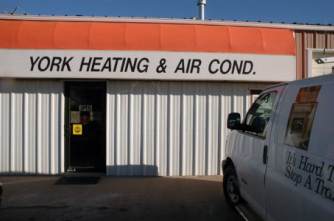 In 2009, Gary opened a second location in Henderson NE, known as Henderson Heating & Air. We are proud to serve the York, Nebraska area. See what real customers have to say about us on our Testimonies page! Contact us today; we look forward to working with you.